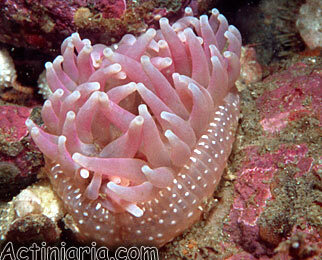 This common and widely distributed in North Pacific species is often wrongly named Urticina lofotensis. 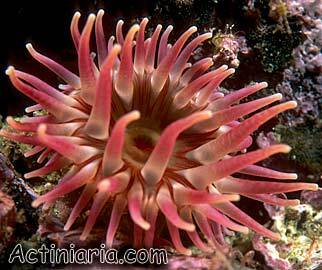 Actually, Urticina lofotensis is an invalid name applied originally to a very different European species currently known as Urticina eques. 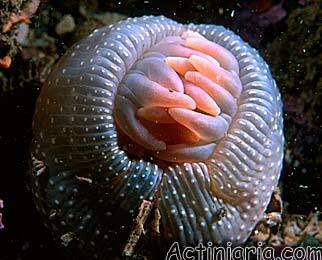 The fact that the Pacific specimens known as "Urticina lofotensis" do not belong to this species was recognized by European taxonomists for a long time (e.g. Manuel, 1981, 1988, Den Hartog, 1986) and discussed in details in our publication (Sanamyan, Sanamyan, 2006). 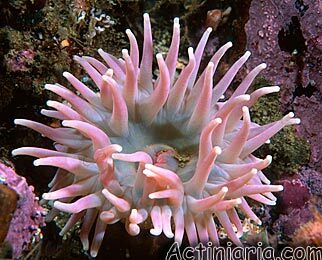 Actually even a brief look on the photos of living European and Pacific specimens left no doubt that they belong to different species, the original European "Urticina lofotensis" is a very different species not resembling Pacific anemone externally. 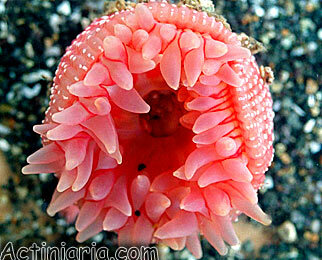 The Pacific species has white, always well visible verrucae on usually uniformly colored crimson column. In European species the verrucae are smaller, usually inconspicuous, they may be whitish, but often of the same colour as the column and the species look completely different. Surprisingly, despite these pronounced differences many websites and internet databases still wrongly list "Urticina lofotensis" as a valid Pacific species. The internal morphological differences between Pacific and European species are even more pronounced - actually these two species belong to two different genera having different internal morphology and different set of nematocysts (stinging capsules): valid name for European "Urticina lofotensis" is Urticina eques, and valid name for Pacific "Urticina lofotensis" is Cribrinopsis albopunctata. In most specimens of Cribrinopsis albopunctata the cylindrical column is dark red or vermilion, sometimes paler, rose colored or white, becoming paler toward the base. White adhesive verrucae are arranged in longitudinal rows. The column may or may not have a few attached gravel particles or broken shells. The oral disk is commonly of the same ground colour as the column, or sometimes differently colored, greenish or olive. 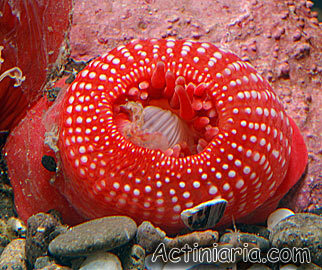 Dark red radial bands running from the middle of the oral disk, outline the tentacle bases and form a characteristic colour pattern. In the pale or white specimens the disk may be uniformly colored. 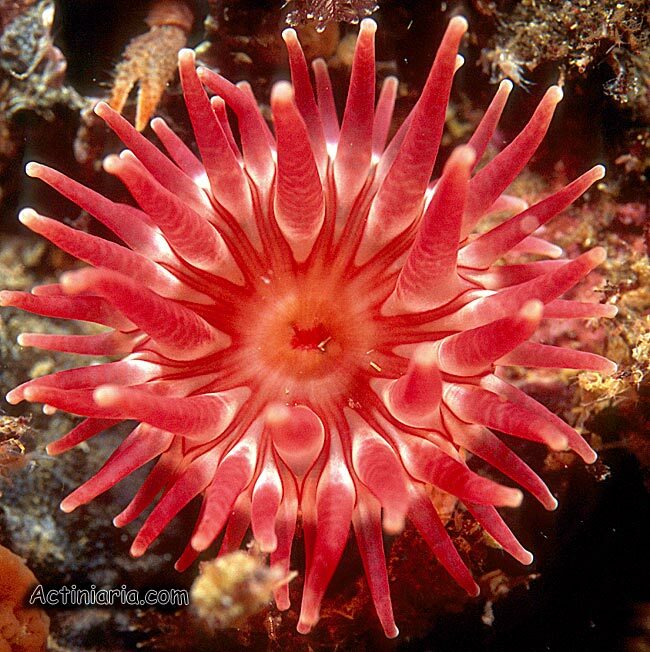 The tentacles are conical, pointed and slightly longer than the radius of the oral disk, uniformly colored red, rose or white along most of their length, usually with the white patch on the bases.